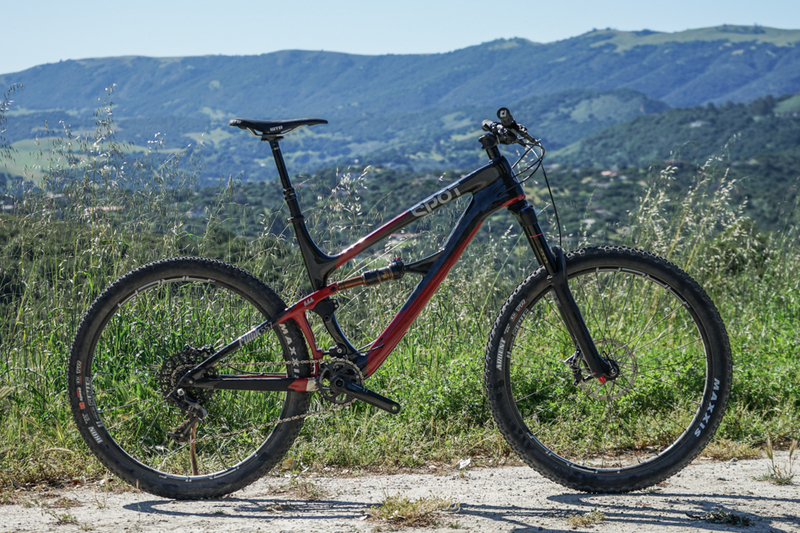 We were as surprised as anyone to see Spot, a brand known for making rad hardtails, come out with a carbon full-suspension bike, and we were even more surprised to pull the Rollik out of its box and see a chassis that you wouldn’t guess is in its first year of production. We checked in with two of the guys behind the Rollik to find out more about Spot and the bike’s unique suspension. Wayne Lumpkin, owner of Spot, has patented dozens of innovations in the industry and is best known for founding Avid. Andy Emanuel worked for Paul Turner’s Maverick bike company for four years, and has had a hand in non-bike projects ranging from paraglider components to mobile phone mounts to heavy industrial manufacturing. It's pretty impressive to do both carbon and full-suspension for the first time simultaneously, and it's even more impressive to do so with a new, and pretty unique linkage. What did it take to make it happen? Andy Emanuel: Spot may be the little guy, but we punch well above our weight. Located in Golden, Colorado, our entire operation rides mountain bikes nearly every day. Our small crew with its diverse talent pool is led by Avid founder Wayne Lumpkin. Through his career, Wayne has generated some of the most varied and valuable intellectual property in the bike industry. There is no shortage of passion, energy, or new ideas at Spot. As life-long mountain bike enthusiasts, we've ridden, dissected, and analyzed a broad range of suspension systems. The modern dual-short-link bikes have shown many advantages: easily tunable kinematics, a stiff one-piece rear triangle and good packaging options. We wanted to take this system a step further to improve the lateral stiffness, reduce the moving parts count, and add an element of spring curve tuning. Developing the Living Link began by fabricating aluminum test mule frames with titanium leaf springs. As we learned what the leaf spring could do, we iterated the frames, tried different leaf spring inflection points, leverage curves, and tested some new geometry concepts. While titanium makes a good spring, we knew we could push the leaf spring fatigue life into the stratosphere with a composite material. With the help of a local composite-technology company specializing in high performance military and bio-medical equipment, we were able to engineer a spring to our strength and stiffness requirements. To fatigue test the leaf spring, we designed and built a cycle-testing machine that flexes the leaf spring to the same maximum bend angle as the bike, while simultaneously applying a tension load of 450 pounds to simulate the rider's weight. When we loaded the carbon leaf spring into the cycle tester a funny thing happened: it wore out every moving part on our test machine. Numerous bearings, pivots, rollers, chains, gears, and linear guide parts later, the leaf spring breezed through 3 million cycles with no failure. Based on our on-bike data acquisition systems, 3 million cycles is equivalent to riding technical trails every day for over twelve years. Why the leaf spring instead of a lower link? What does the spring do that a link doesn't? Andy Emanuel: There are construction advantages: stiffness and longevity. All ball bearings inherently have a modicum of play. A small amount of slop in a bearing near the middle of the bike becomes a lot more at the extremes–like at the rear axle. Even at a very low level, any uncontrolled motion in a suspension linkage becomes an additional distraction for the rider. The leaf spring helps minimize lateral flex. Think about a metal ruler–it's easy to bend in one direction, but very difficult in the other. The leaf spring works the same way: it readily flexes vertically, but is very stiff sideways. In addition, anyone who's owned and ridden a dual short link bike for a season or two knows that the lower rear pair of ball bearings are the first to wear out. While these frames must rotate at that point, they don't have to do so on tiny metal balls when the degree of rotation is so small. The leaf spring accommodates this motion in a much simpler way. So the leaf spring makes a stiffer frame and lengthens the maintenance intervals. What doesn't it do? Wear out. What were the challenges in developing this platform? Andy Emanuel: We set out with a goal in mind to make the best all-around mountain bike. As Colorado riders know, a mountain bike has to pedal well. This is non-negotiable on steep rough trails, which are best tackled without shock lockouts. It also has to descend equally confidently down that same tricky terrain. Most mountain bikers have one, or at least a "primary", bike that sees the majority of their miles. This had to be that bike. In chasing that goal, we had countless decisions to make in this development process. We learned early on that the Living Link has some tangible performance advantages. We devised a system on our test mules that enabled us to vary the inflection point of the leaf spring. Basically, we could clock its rear mounting structure so that it was relaxed at top out, bottom out, or anywhere in the middle of the stroke, without changing the anti-squat or shock rate curve. This helped to prove our assumptions and calculations about this system. Some orientations made pedaling along hardpack dirt feel like sand, yet others had us thinking there was a secret seat tube motor installed! The production Rollik you've been riding is the result of many hours fine tuning the spring contribution. As a small brand, I imagine it's challenging to find and negotiate with a reliable carbon frame manufacturer. How was your experience with the sourcing process? Andy Emanuel: While this is our first frame of its type, our team here has extensive history manufacturing in Asia. While my past at Maverick, as well as a few other consumer product ventures, has opened some doors for Spot projects, it pales in comparison to the extensive network that Spot's owners can call upon from their success story with Avid. We have established a mature, reliable supply chain in Asia. The factory that produces the Rollik is one of the best in the world, and is used by a number of much larger bike companies. We are continually impressed by their commitment to producing very strong, high-quality products. What kind of spring curve were you after when designing this bike, and how it achieved? Andy Emanuel: Spring curve manipulation can make a good bike bad, and in some rare cases it can make a bad bike good. It's universally accepted that a good bike should have easy stroke initiation near topout. This aids traction any time the bike is unweighted, like in off-camber corners or floating through a rough section. It's also important to have good bottom-out resistance. This means different things to different people. An aggressive rider who hangs off the back will need more than a more conservative rider who weights the front. The Rollik has a very progressive beginning stroke for that easy initiation and to keep the tire in contact with the trail under big weight shifts. The middle to end stroke becomes more linear, which works in conjunction with today's high performance air shocks, which offer good bottom–out resistance, and typically can be tuned to supply more or less based on personal preference. 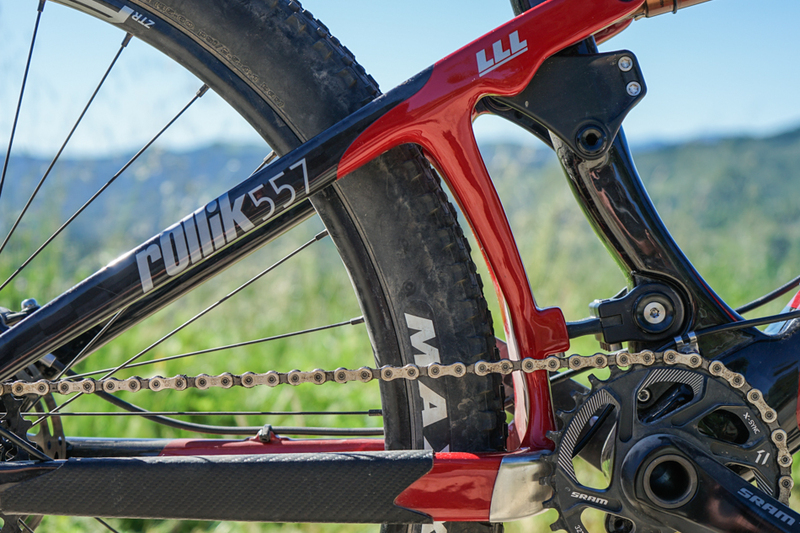 The Fox Float DPS Evol shock on the Rollik is configured from the factory to allow the rider to add or subtract volume from the air can as necessary. We wanted to allow a wide range of spring curve possibilities with this shock, instead of pigeonholing ourselves into a progressive bike or a linear bike. The leaf spring adds a variable to the suspension that doesn't exist with most systems, since it seems to create its own rebound. When removing the shock and moving the bike through its travel, you can definitely feel the spring affecting the monkey motion. Can you explain what it's doing throughout the stroke, and do you compensate for this with the shock tune? Andy Emanuel: The leaf spring is relaxed at top out and bottom out. Its strongest influence is in the sag range, where it adds a little extra positive spring force, before becoming neutral again at around 50% travel. This spring curve behavior provides the ability to design more anti-squat response into the frame without the usual drawbacks of excessive chain tug, harshness under power, or poor traction. While some flexing stay bikes try to force the bike to stay in the sag range, ours does the opposite. The Living Link's neutral point at half-travel adds a degree of compliance through its willingness to move that other flexing designs lack. It creates an active, responsive ride that is surprisingly efficient when climbing. Wayne Lumpkin: In addition to the compression characteristics, the leaf spring has an advantageous effect on the rebound behavior. That same positive spring force in the sag range creates a progressive effect on the rebound speed. 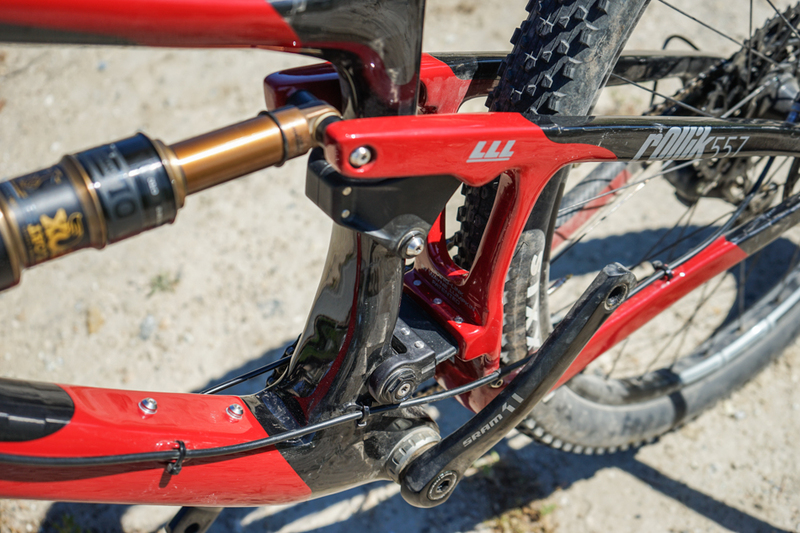 Think of it as a little extra push on the rebound from 30% to 10% of the suspension travel. 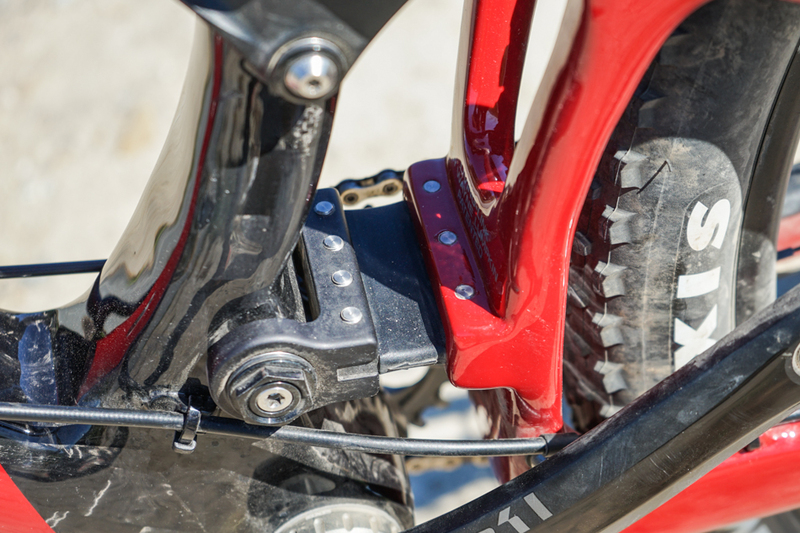 This extra force aids the rider in clearing technical obstacles and keeps the bike from wallowing in the dips. But don't think this makes the bike feel bouncy: this force dissipates to zero before topout. Andy Emanuel: The leaf spring does not create a condition for which the shock needs to compensate: it enhances the ride performance of the frame. We've developed the bike using a wide variety of shocks, and all the conventional options have yielded excellent results. We worked closely with Fox to bring out the best in the Rollik, but the tune on the supplied Fox shock isn't unconventional in terms of damping and air spring volume. We’ve got a Rollik in for testing on our local trails, so stay tuned for a complete review soon.